Did you miss booking during the Air Asia Red Hot Sale? Don’t worry you can still book affordable fares for 2019! This time, Air Asia is offering the Piso Red Hot Sale for 3 days from September 21- 23, 2018. Red hot sale tickets can be used for flights starting April 1 to July 31, 2018. Book the Air Asia piso sale ticket using the airline mobile app. In the Philippines, Air Asia fly to Manila, Cagayan De Oro, Caticlan (Boracay), Cebu, Clark, Davao, Iloilo, Kalibo, Puerto Princesa, Tacloban and Tagbilaran. The low- cost airline has direct flights from the Philippines to international destinations including Bali, Hong Kong, Kota Kinabalu, Kuala Lumpur, Macau, Seoul, Shanghai and Taipei. Also, Air Asia has many connecting flights to various foreign destinations via Manila to Kuala Lumpur. To avail the Air Asia affordable tickets, you need to book via the Air Asia mobile app. Use the Air Asia mobile app to book the red hot promo tickets. Start your search for promo ticket by downloading the mobile app at http://bit.ly/DownloadAirAsiaMobileApp. Yes, you may search, book and manage your flights directly from any Android or iOS devices. Thus, you can plan and book your trips anytime, anywhere you are. Other than the above, you may also pre-book your checked baggage, meals, preferred seat and travel insurance with just tapping your phone using the mobile app. In-App Payments for promo fare fares booked via the mobile app thru Visa, MasterCard, Amex credit and debit cards. You may also use BIG MasterCard, and Air Asia EZ prepaid cards. 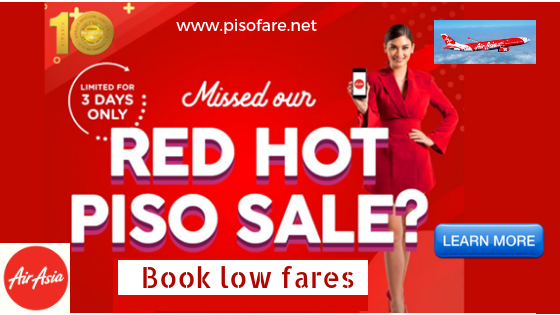 Air Asia red hot piso sale promos are limited and may not be available on all flights! Watch out for promo updates of Air Asia red hot sale 2018- 2019 and other airline promos 2018 to 2019 in our Facebook: PISO FARE TICKET!